Google Stadia - "The Future of Gaming is Not a Box"
Google launches Stadia streaming platform. What makes this unique is that the system is designed with “Let’s Play” and Twitch streamers in mind with built-in functionality to catch your highlights and video edit them, upload them. Not sure what this is, but sounds similar to the Highlights feature now included with Nvidia GeForce Experience that comes with Nvidia video cards. I suspect it should also be possible to watch your favorite Streamers playing on this platform. Also a new “Share State” feature that allows you to save a state and pass it on to someone else so they can experience what you experienced. For example, someone can save a state before a particular boss fight so you can then access this State and experience the fight yourself. The Stadia system was prototyped using ASSASSIN’S CREED: ODYSSEY in December 2018. That test required at least a 25 MBPS Internet Connection. Google has updated that saying Stadia can run games on a 15 MBPS connection, but only if your latency rate (“ping”) is no higher than 40ms. DOOM ETERNAL will be a launch title, though no release date was given. It must be noted though that DOOM ETERNAL has also been announced everywhere including the Nintendo Switch which some believe is being singled out as a rival. Google has also yet to reveal pricing for the service, but similar streaming services like Playstation Now have charged about 19.99 USD per month in an annualized form as a precedent. This feels strange. I wonder how much complicated inputs/outputs gamers can perform, especially when every command is delivered and executed through Internet connection. Even present day MMOs still have lagging issues. It must be said that Stadia isn’t the very first commercial streaming service. We’ve had GeForce Now (which was associated with the Nvidia Shield Tablet and game controller +Screen device). Playstation Now… On-Live. Even Nintendo Switch has a game streaming ecosystem, though right now that only works in Japan. These guys will get Stadias from Day 1 and will be live the moment you plug yours in. The selling point could be the “community experience”… Streamers saving states so you can share in the highlight yourself rather than just watching them on YouTube. So the moment you’ve paid your fee, you have “instant access to every AAA game in Stadia’s library” and it’s like you’re virtually a streamer yourself… You watch them play a game… and you jump right into the same game… That tricky jump, level, or whatever the streamer considers a highlight can also be yours to experience. That sounds like where they’re going with it. Ah, I see. It’s true that these days are all about online communities and interactions. I guess I will miss the days when we got a game day 1 at a game shop, played a hell lot of it, then discussing with friends at school or workplace the next day. Bringing consoles to friends’ places is the definition of fun at early 2000’s. Assuming Stadia launches day 1 of DOOM ETERNAL, you will have a choice between playing it via subscription or owning it on a Nintendo Switch Cartridge (plus a one time 9 GB download most likely)… what would you rather have? For us outside the US we won’t get Stadia until maybe 2030. hahaha. Yeah, gotta cherish poor connections in our countries. I would still prefer having games downloaded, so I can feel those games truly belongs to myself. We’re still not at the production-level quality, though. The demo we played retained the 30fps performance profile we saw in the Project Stream demo, and the video quality itself was still at 1080p - Google is promising 4K and HDR for the final release. On top of that, the system itself we saw lacked any of the YouTube integration or other cloud features. 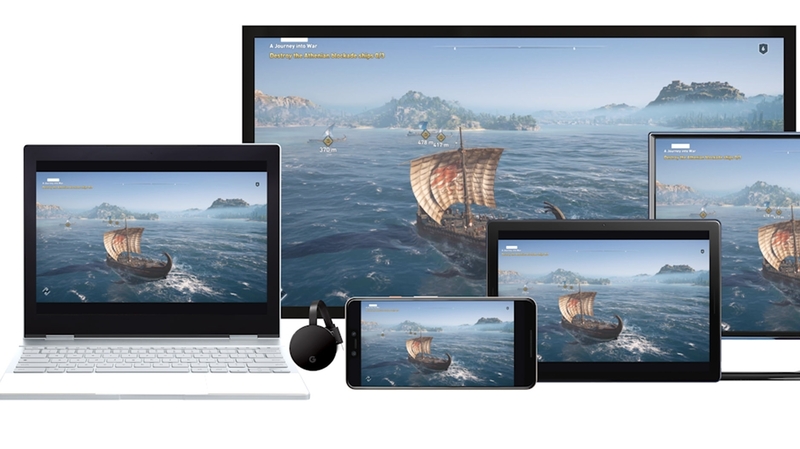 We’ve established that Google isn’t making a console, instead leveraging the ubiquity of the Chrome browser and its Android OS to deliver streaming clients for computers and phones, while Chromecast delivers a gaming experience for any HDMI display. What’s missing is a controller. For computer owners, any USB HID device - like a Dual Shock 4 or Xbox joypad - will do just fine, but those using Chromecast lack any kind of input device. That’s where Google’s controller comes in. Three aspects set this device apart from other pads. Firstly, although you can hook up a USB-C cable and use it on your computer (it worked just fine on my Mac), it’s primarily WiFi-based. The Google controller is actually a client device in its own right, meaning it has a direct connection to the cloud server and doesn’t need to go through your screen, phone or computer. It also makes it easier to swap your game instance from screen to screen - by default, the server instance persists and the same game is playable if you decide to switch from, say, living room display to your laptop. 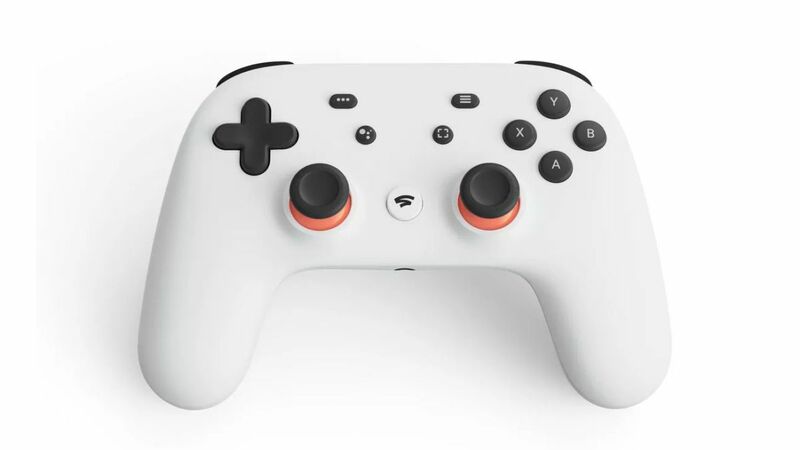 The controller also has a share button (Stadia automatically saves off a 4K60 HDR stream of your gaming) and in addition to that, there’s an option to invoke Google Assistant for voice control of what would usually be traditional UI features (though there is a UI too). So, yes, the Google pad has an in-built mic. If you have a very wide internet connection, Stadia supports 4K video at 60 frames per second with HDR support. However, based on conversations with Google, we expect that 1080p streaming is more likely to be the norm on connections with around 25mbps of bandwidth. Stadia will go lower, dropping down to 720p60 with connections in the region of 15mbps - but having seen it in action with an artificial cap in place, it’s clear that fast action causes obvious artefacts on a large, living room display. Google itself considers this to be a ‘worse case scenario’. The experience would likely hold up much better on a smaller screen. I wonder how many people will reach bosses of games like Dark Souls with little to no XP gained and no equipment, just to give people even harder challenge than playing games themselves. Their mock-up featured clicking “Play Now” on the AC ODYSSEY trailer and then immediately playing ACO “within 5 seconds”. The idea being “People who Play Games are connected with People who Watch Games”. I think it won’t all be positive though… Stream-Killing - abuse where viewers watch a stream of ongoing matches so they can kill the streamer during a match - will also be taken to a new level because now you can invite everyone to watch you commit your crime by simply pressing share on your Stadia controller as you hunt down the streamer using another device that has YouTube playing. Also of interest is a note that says Stadia will also be used by Developers. Devs will be able to make the game right in the cloud, and publish it also there right in the cloud. They also announced Unreal Engine, Unity, Vulkan API, and Havok physics engine will already be available for Developers in Stadia. That internet connection tho… Why are they launching this now? Is Google also in the ISP business? They gonna wire up everybody in 200 countries to 200MBPS internet to run Stadia games? i’ve been using GeForce NOW for a while, mainly to play Hitman. i don’t have a good PC, but my internet connection is pretty good. the streaming quality is good, only a really tiny amount of times where the resolution might drop for a minute. small input lag, not noticeable on Hitman, but definitely noticeable on FPS games. Yeah, let’s trust Google, the same people that thought what they did with YouTube Rewind 2018 would be a great idea. What? YouTube was the brains behind YouTube Rewind. Google only owns YouTube and YouTube seem to mostly have autonomy in how they operate. (Unless I am mistaken) Plus Google’s game streaming division is a completely different department. My personal experience with streaming, being in the Philippines has been limited to using Steam Link on our home network as well as PS4 Remote Play (to play HITMAN and HITMAN 2) on our home network. In fact just last weekend it was something of a head to head, me and my younger bro were both called to assemble in one room by our parents and we were both playing at the time… I walked in with my Switch in handheld mode playing Diablo 3, and he walked in with his Macbook to fire up PS4 Remote Play. There was a time, when the network wasn’t so good that I got to chuckle at HITMAN freezing up and all… but a bit of upgrading later and basically he’s able to stream high end PS4 games anywhere… within the house and have Steam games streaming to our Smart TV. So I guess in a larger scale Stadia could work wonders. I do know that if all things were equal - internet speeds, pricing - gamers will find a platform where they can basically become a Streamer or participate with a Streamer as the most appealing service for the same price. The real question is if Streaming Viewers can be turned into Streaming Gamers. Also if State Sharing actually becomes a thing - click the “Play Button” on a thumbnail image and then instantly be playing the game from that saved state moment for a certain amount of time like some kind of interactive YouTube video. @David_Spafford Interesting stuff. What do you think the future of gaming will be like in light of how much development is going into the game streaming industry nowadays? Imo, they are jumping on the bandwagon and this is doomed to fail. *Remembering this for whatever is announced by Sony in whatever event they run this year instead of attending E3. Oh boy, can’t wait to play Gmail 2 with my friends and family! On a more serious note, anyone remember OnLive? As far as I know it was the first game streaming service ever. I tried it myself and well… the lag spoke for itself. 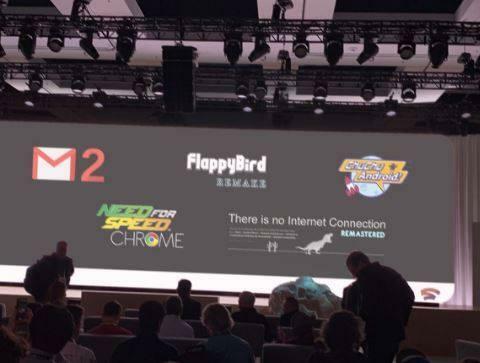 I can see this working if support for Stadia will flourish and lag is not an issue. However, I highly doubt even Google can get over the horrors of any type of lag. Imagine playing a fighting game on this service. Agreed, it ain’t the same as having a copy of the game that is “tangible”, for the lack of a better word. Moving everything to the cloud would put us at the mercy of greedy publishers who don’t give a rat’s rear about preservation or the community. It isn’t that much different from having a Steam profile, right? I do agree that it might feel “weird” at first that you’re not running the game yourself on your own machine. What Steam was for people who like owning game disks, this Stadia is the same for people who like having games installed on their hardware.